SCHAUMBURG, Ill. — Experian Automotive announced it now provides the AutoCount Risk Report, which is designed to combine key market share information along with Experian's credit scoring to help lenders increase their auto loan offerings with dealers. 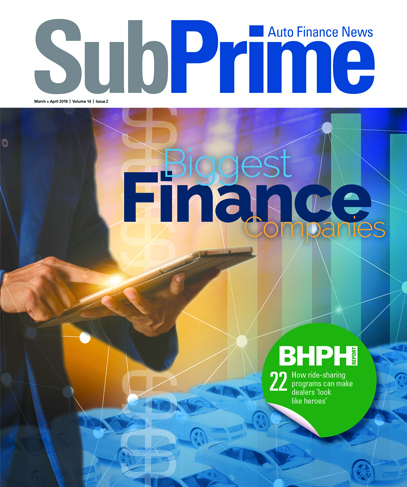 "The AutoCount Risk Report is not a credit analysis of any particular loan," Melinda Zabritski, director of automotive credit for Experian Automotive, explained to SubPrime Auto Finance News. "Rather, the report provides the average credit score of the loan across all lenders as issued in a particular geography," she continued. "Data is broken down by lender and available to everyone purchasing the AutoCount Risk Report." She said the new offering provides median credit scores specific to vehicle title transactions reported by the various state departments of motor vehicles. Zabritski noted that the data can be displayed geographically how the lender requests it, such as broken down by ZIP code, ZIP radius, county or state. More specifically, officials said the report combines AutoCount's market share data with average credit scores on loans originating from dealers and the lien holder. The data is offered in more than two-thirds of the states in the U.S.
"Lenders use this data to gain more accurate, competitive market share information in order to help diversify the number of dealers with whom they are working, appropriately price their products and improve their overall relationships with indirect lending channels," she highlighted. According to the company, lenders can use the reports to better understand their market based on which vehicles are selling and at what volumes. While the lenders have access to the reports, Zabritski said they cannot share the data with dealers. "Regarding the sharing of this information with dealers, all AutoCount Risk Report customers are not permitted to share or reproduce the information contained in the report under their contract with Experian," she said. Executives said the AutoCount Risk Report uses VantageScore from Experian, which is a universal, predictive and consistent credit-scoring system developed in partnership with other national credit-reporting companies for consumer credit markets. "By looking at overall markets based on this uniform measurement of credit quality, lenders can more effectively target specific dealers with the most appropriate loans by understanding the average scores for loans covering new and used vehicles," officials explained. For those lenders working the subprime arena, Zabritski said the report can be especially helpful. "There are definitely increases in full-spectrum lending, with subprime remaining a growing market across all lenders," she pointed out. Kerry Williams, group president of Experian Information Solutions, added, "Incorporating Experian's consistent, objective credit scoring with the industry-recognized market share data from AutoCount creates an entirely new level of market insight for lenders. "The AutoCount Risk Report equips lenders with the ability to identify what loans are performing and where, as well as what markets offer them the greatest opportunity for growth," Williams continued. Discussing the inspiration behind the new offering, Zabritski explained, "Upon Experian's acquisition of AutoCount in 2004, it was seen as a logical next step to pair Experian's extensive expertise in the credit arena with AutoCount's expertise in lender market share reporting. "Lenders definitely wanted this kind of information in order to better understand their market, diversify their loans by geography and ensure they deliver the best products to their dealer customers," she concluded. For more information on AutoCount and Experian Automotive, visit www.autocount.com and www.experianautomotive.com, respectively.